The famed and also infamous Roman gladiators, the men who battled in the amphitheatres of Rome, putting their lives and reputation on the line every time they stepped out onto the sand. 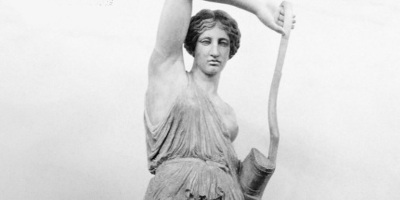 These men and often reported women, were often slaves or criminals forced to do battle against one another, but the reward for their success did exist, they might gain fame, notoriety or even earn their freedom. But it's important to note, that not only was it slaves or prisoners who did battle here, free or even noble folk could try their hand in the arena, often hiding their true identity with their helmet. The word gladiator comes from Latin origin and translates as 'swordsman'. This is very fitting as this is the primary weapon of the gladiators and was likely the first they used. 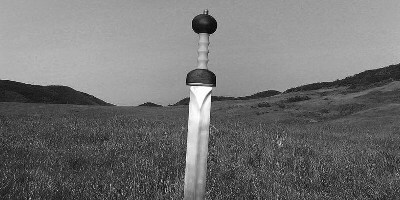 The Roman short sword the Gladius was one of the most popular weapons, and for good reason, nearly everyone knew how to use one, and it was very effective. 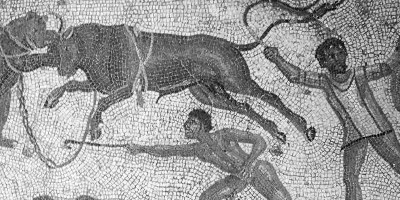 Of course the gladiators were tooled with an array of weapons, from spears, to tridents and nets, the range of weapons added to the whole spectacle of the gladiators themselves. 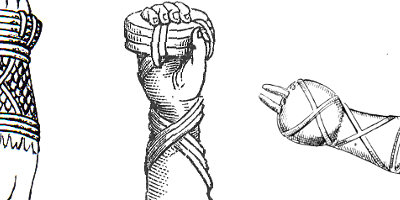 The reasoning of the gladiator games was important for multiple reasons in Roman society. 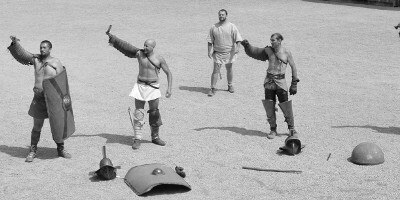 Firstly the gladiator battles and the Colosseum entertainment as well acted as a focal point for the Roman citizens. 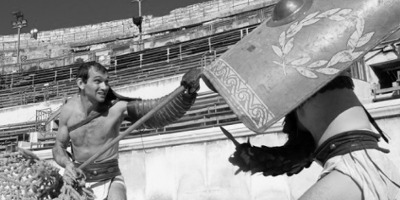 The politicians of Rome, knew that people need things to keep them entertained and the gladiators were one such form of large scale entertainment. In addition Rome was almost constantly at war, and for the Roman army to be successful a certain spirit was required from their men. 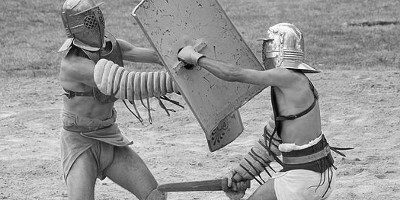 The gladiator battles were one way to show that bravery was rewarded, if a gladiator succeeded in battle or lost with bravery they were often rewarded or spared their life. This was almost a mantra the Roman government needed from their solider, unwavering bravery in the face of the stiff competition and the gladiators provided this example perfectly. 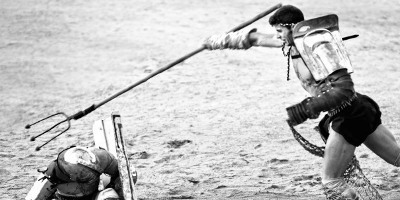 The origin of this bloody sport was thought to have a religious substance which was to honour their dead. 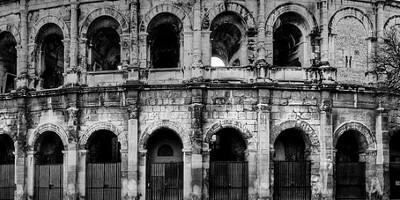 As time passed however the it became a heartless display of wealth where the gladiators fought for entertainment of the spectators. 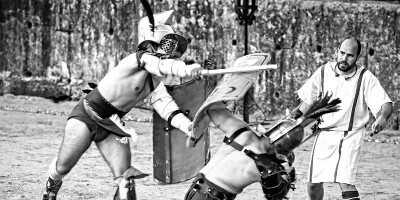 It would have taken a lot of resources to organise an event of the magnitude of the gladiator battles and to make it as grand by ensuring there was a great mix of entertainment on display for the Roman public. 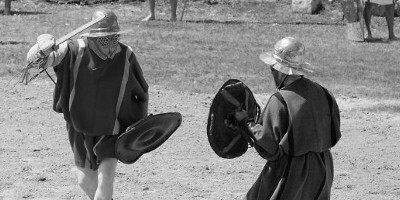 While gladiator battles actually only cover man vs man, there were other forms of entertainment were man fought against animals however these were technically not gladiator fights. 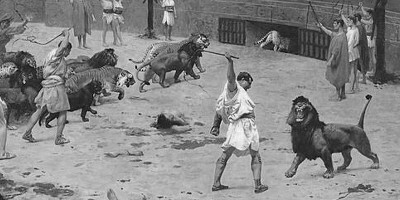 Elephants, Tigers, Lions and Rhinoceroses were thought to be some of the creatures that fought against men in the arena, with most entertainment here coming under the names bestairrii or ventatores. The famous Colosseum in Rome was the centre of the Gladiator sport, and while not the first area, it was definitely the most famous. The name itself comes from the Arena sand that covered the ground, and this sand worked amazingly well in soaking up blood that might be spilled from the various contests. 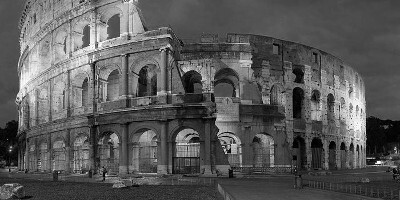 The Colosseum itself was built in 72 CE under order from the the then ruler Emperor Vespasian. It was and still is one of the most impressive pieces of architecture to have ever been constructed, and in its time was something that would have inspired the Roman people and reminded them of their great city and civilisation. 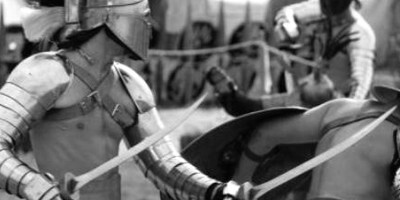 Of course with the Roman gladiator battles, not every gladiator was the same, and they were broken down into gladiator classes. 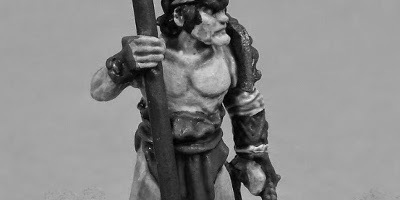 These classes all had their unique styles and armaments and were often matched up with other similar gladiators, or very different styles of gladiators. 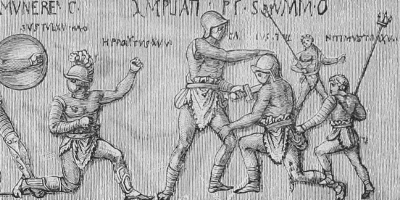 It was common in ancient Rome to use gladiators as a way of representing real life as well, and as such many gladiator classes were actually based on foes, or defeated foes of Rome, like the samnite gladiators. 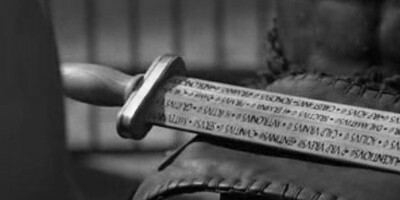 ‘Uri, vinciri, verberari, ferroque necari’ which translated means ‘I will endure to be burned, to be bound, to be beaten and to be killed by the sword’. These uttered words signify the gladiator denouncing his freedom. 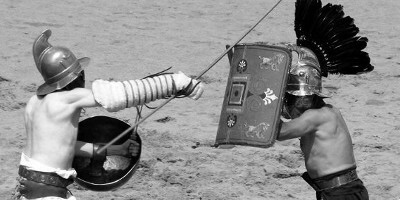 In his last minutes, a gladiator is expected not to ask for mercy nor display any cowardly or weak act in order to be considered as having a ‘good death’. 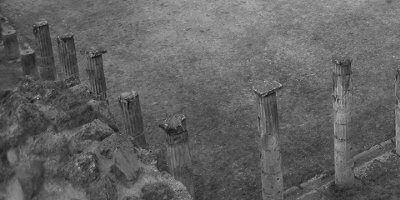 To be a Gladiator meant that while you were often a slave or an un-free man, you could be compensated very well should you have success. The skilled and thus successful gladiators became very rich and were allowed to have families and live a more normal life. 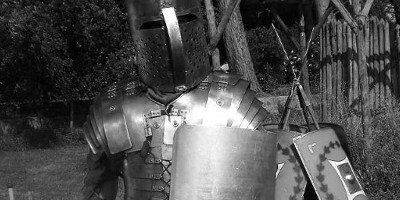 To be a success in the gladiator arena may also result in a man’s freedom, becoming a gladiator trainer or even chosen as a politician’s bodyguard. 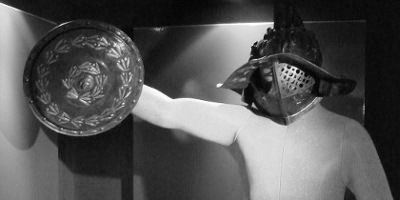 Apart from wealth and other perks a good gladiator might honoured like a Roman soldier that died in a battlefield. It was this fame and glory that enticed even free and noble men to choose this brutal and punishing lifestyle. The most famous of all Gladiators was Spartacus, who led several gladiators to escape and rebel against the Roman empire. 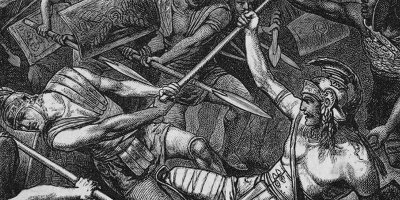 Spartacus managed to acquired thousands of gladiators to support him and for a while Spartacus and his army were almost unbeatable. It took legions of Roman Soldiers under Marcus Licinius Crassus and several wars, spanning multiple years before he was defeated along with his army. Many other famous gladiators litter the history of the Colosseum, from citizens who chose to fight like Marcus Attilius, to condemned slaves like Flamma, whose name literally means ‘The Flame’ and chose to live his life as a full time gladiator even after earning his freedom. 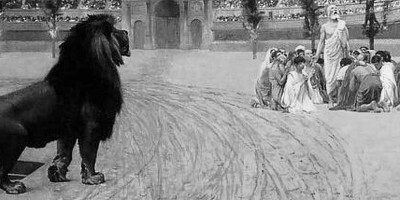 Often in Rome, it was the spectators who decided the end of the match, whether to kill the losing gladiator or give pardon for his displayed courage. 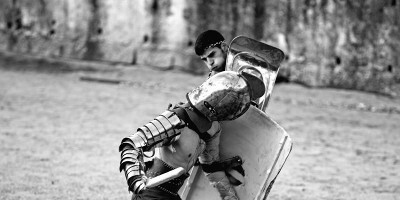 Courage meant offering ones neck to the champion and facing death without a sign of fear. It’s widely thought that if the crowd were to signal thumbs down would mean that the successful gladiator would end the life of his defeated foe. 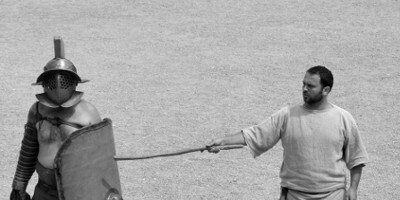 After death gladiators were often buried nearby and there was often a burial site near an arena. 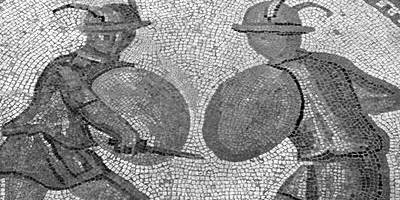 Gladiators who died bravely were taken with dignity, and prior to death, their union called collegia, and ensured their proper burial and that compensation were given to their families. For particularly famed or brave gladiators their tombs were often separate and special inscriptions where commonly written on their tombstones describing their bravery and skills. 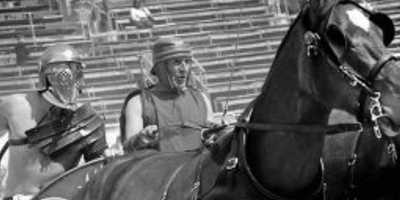 On the other hand for gladiators not so brave, this was almost considered a disgrace to die this way. 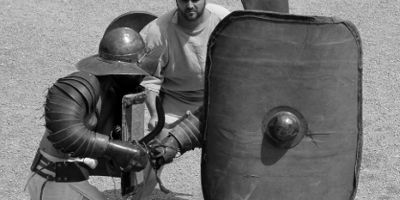 If a gladiator was not brave, a designated person dressed as the god of the underworld would go to the arena and make sure the defeated gladiator was dead by hitting him with a mallet, rather undignified, but a sure way to ensure the unbrave did not survive. Another way to check for life would have a man dressed as the Roman god Mercury testing for remaining signs of life by piercing with a heated sphere. Once everyone was satisfied the unbrave gladiators were dead, the body would be dragged away from the arena. 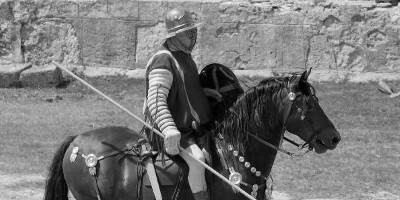 Gladiator Sport was banned in 325AD but our fascination for the Gladiators and their stories continue. 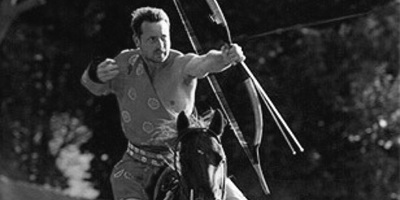 Many modern movies and books are dedicated to these brave fighters, and the whole idea of the gladiator is often recreated in varying ways in modern media and sports. 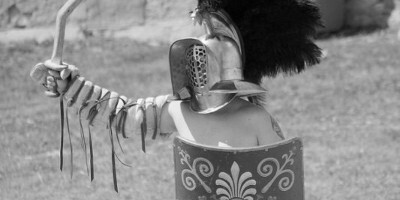 For the very brave there are even modern day gladiator schools, that teach its students combat and actually let them wear the full metal armour as the historic gladiators would have done.